Here is a widely accepted rule of thumb in politics: Government entitlements, once conferred, can never be taken away. Government entitlements, by their very nature, tend to be permanent. A corollary to this rule of thumb is that people who become addicted to government handouts will automatically vote for candidates who promise to feed their habit. No politician understands this rule of thumb and its corollary better than Barack Obama. In fact, President Obama not only understands the principles of entitlement and dependency, he is using them in a concerted effort to keep himself in office and to ensure that the radical left will maintain power in Washington, D. C. long after he is enjoying the substantial perquisites of being a former president. If it were not such an unscrupulous, unconscionable, deceitful undertaking, one could almost admire President Obama’s single-minded determination to achieve his nefarious goal. And what is that goal? It is nothing less than an entitled America populated by citizens who are so dependent on the government that Democratic victories in future congressional and presidential elections are guaranteed. But in their zeal to create dependency, what President Obama refuses to acknowledge is that when our country reaches the tipping point where more people are taking than giving, the economy will fail. When this happens, it won’t matter how large a majority the Democrats enjoy in Congress, there won’t be enough dollars in the federal treasury to pay the entitlements demanded by their dependent constituents. But, like all liberal Democrats, Barack Obama lives in the moment with little or no concern for the future. His attitude can be summarized in these words: I’ll get mine now and let the future take care of itself. So what is Barack Obama doing to get his now? Plenty. First, he using subterfuge to remove the work requirement from welfare. This, of course, will make it easier and more convenient for people to get themselves on welfare and stay there. The work requirement was the most important component in the Welfare Reform Act of 1996. It reduced substantially the number of people collecting welfare. More importantly, it got people working who had never before viewed that as an option, thereby breaking the cycle of welfare. 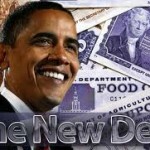 Second, President Obama has undertaken a concerted effort to increase the number of Americans receiving food stamps. When Barack Obama took office, 30 million Americans were receiving food stamps, a number for which President George W. Bush is partially to blame. Today the number is 46 million and climbing. That is a lot of Americans who can be depended on to support Barack Obama and other liberal Democrats in their re-election campaigns. There is something fundamentally unsound about giving voting rights to people who take from the system without contributing anything. Why should they work when they can simply vote the income they need out of your pockets into theirs? The president’s third tactic to increase dependency is to increase the number of people covered by Medicaid. Now that the Supreme Court has given its approval to Obamacare, people are no longer required to fall below the poverty level to receive this entitlement. Medicaid coverage, under Obamacare, will be extended to people whose income is up to 33 percent above the poverty level. Every new person who is entitled to Medicaid can be depended on to vote for President Obama and other liberal candidates. November 2012 represents one of the most important dates in our nation’s history. Either America will pull back from the economic precipice or rush headlong over it. Once over the cliff, it won’t matter how many entitlements Americans qualify for, the federal treasury will be like the drug pusher who no longer has access to product. He cannot give what he does not have.